I’m not a fan of concept posters. I dislike those 8 laminated words displayed on the wall. You see, I don’t much care whether a student can remember the term “causation”. I think it’s a cumbersome, clunky noun that is unnecessary in the vocabulary of a 7-year-old English language learner. 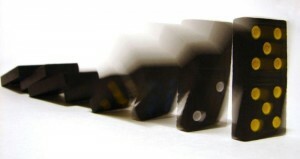 But don’t sack me just yet – because I do care deeply that the same child can ask “why?”, design repeated experiments to test cause/effect, come to a conclusion about why dominoes fall, and see the bigger picture of how “the domino effect” is relevant to their physical world, the consequences of their actions and the interdependence of families. My students may never say the word “causation”, but deep conceptual understanding will be achieved in my classroom, if I’m doing my job. Concepts are over-arching mental constructs that students need to make sense of the content we teach. Conceptual understanding enables students to apply facts and skills to the world around them. By starting with concepts, we create a curriculum that’s worthy of our students’ time and effort. The concepts that drive the PYP are timeless (factual examples change, but not the core understanding), universal (so students can apply understandings across cultures, situations and disciplines) and abstract (so students engage in higher order thinking to grapple with central ideas). By helping students achieve conceptual understanding, we ensure that they can take facts and skills, and do something with them beyond this moment, this lesson and this classroom. I have seen plenty of students who can accurately convert between metres & centimetres but are unable to choose an appropriate length of skipping rope for a 3-person playground game. These students had mastered a mathematical skill in isolation, but not yet developed a conceptual understanding of length. Once you’re on the path, your whole day will open up. You won’t be stressed about finding time to “fit in” length, area, volume plus a Unit of Inquiry into Homes. Teaching through a conceptual lens compacts your curriculum. By designing an inquiry around a couple of significant concepts (in this case, form & connection), you can effectively tie together all those facts and skills. You will spend more time inquiring and less time spoon-feeding. It’s not difficult: students construct homes from cardboard boxes to suit certain environments, while exploring faces, edges, vertices, strength, number of houses that will fit on one street, surface area to volume ratio etc. Did you notice that the content became increasingly complex? Differentiation’s a snap with conceptual teaching! (Box Homes project by @LaraRonalds). It’s just so messy. Concept-driven learning is an iterative process of constantly pulling apart ideas, putting them back together, re-applying them to different situations, finding ways to correct misconceptions and enabling each child to make meaning in their own way. It would be a lot easier to say, “Here’s what you need to know, practise that, now you get a sticker.” The problem is that you’d have to add, “Good luck applying that to your life or feeling any sense of excitement”. Factual knowledge is easy to teach because it is simple, procedural and locked in situ. But unless your students intend to live forever in their 4th Grade classroom, that knowledge is utterly useless to them. Use teacher and student questions as a springboard for deep, conceptual dialogue. Sort, unpack and challenge students’ questions. Discuss open vs. closed questions, abstract vs. concrete questions, fat vs. thin questions (i.e. 1 answer or many). Keep asking probing questions (such as How do you know..?/reflection) to prevent shallow understanding. The questions attached to the PYP concepts are very helpful drivers of conceptual inquiry. Design resources and situations that are problematic. Perhaps the facts don’t add up, or there are pieces of information missing. This challenges students to search for connections, inferences and transference to make sense of the inquiry. Anything that is non-linear, with multiple solutions and multiple interpretations helps our students build the flexibility of thinking to grapple with complexity, change and abstraction. Work with single-subject teachers to develop integrated thinking. Students should take their understandings from class to class, exploring concepts through different content and perspectives (e.g. symphony orchestras and bus timetables both build an understanding of systems). Try to keep concepts at the core of your planning meetings, to avoid creating shallow, thematic units. Avoid throwing together “linked activities”. If the students are studying Ancient Greece, don’t immediately say, “Let’s make pots!”. Perhaps the most important concept is “legacies” (connection) and students investigate the influence of the golden ratio on both Art and Mathematics. While studying natural disasters, let students make paper mache volcanoes at home. In class, explore the concept of “impact” (change) on geography, individual lives and communities. How do artists help communities remember and heal after a natural disaster? I love a concept-driven curriculum. I love the fact that the PYP challenges us to teach and learn through a conceptual lens every day. I do believe the 8 Key Concepts provide a strong framework for developing inquiries. But my students will never recite those 8 words on the wall and I’m fine with that. They’re too busy constructing conceptual understandings. Erickson, HL. 2012. Concept-based teaching and learning. IB position paper. Cardiff, UK. International Baccalarueate. Erickson, HL. 2007. Concept-based Curriculum and Instruction for the Thinking Classroom. Thousand Oaks, California, USA. Corwin Press. Erickson, HL. 2008. Stirring the Head, Heart and Soul: Redefining Curriculum and Instruction. 3rd edition. Thousand Oaks, California, USA. Corwin Press. IB. 2007. Making the PYP happen: A curriculum framework for international primary education. Cardiff, UK. International Baccalaureate. While I understand- and agree with- the general point of your post, I don’t believe you are in any way ‘locked in’ to the eight key PYP concepts. As you said, the eight key concepts provide a framework for developing inquiries. They are useful as a starting point for developing the driving questions of units across all disciplines. With all due respect, I think it’s misleading to insinuate you’re ‘locked in’ to using only the eight key PYP concepts. On another note, I discovered you via twitter, and especially enjoyed your riting/speling post! Thanks very much for the feedback and the challenging comments. You are absolutely right – the key concepts are a strong framework for designing inquiries and should not be restrictive – thank you for the clarity and my apologies for the misleading title. It seems my attempt to play with the words “key” and “lock” was unsuccessful! I attended a workshop recently where it was suggested that before inquiries begin, students must be taught these 8 words and their meanings explicitly (& in isolation). I found this approach alarming and disheartening, as it was presented by an IB workshop leader and gained general consensus among the participants (who I respect greatly as educators). After much debate in the workshop and additional reading on my part – I wrote this post to clarify my own thoughts about concept-driven teaching in the PYP. My intention was to suggest that memorising the laminated words should never be a priority nor an end-goal for our students. However, the key concepts are definitely a wonderful starting point for teachers as curriculum designers. We must create opportunities for students to construct deep understanding of these and other concepts, so they may be passionate, flexible, critical inquirers. Again, thank you for the challenge and for continuing the conversation. I completely missed your ‘key’ and ‘lock’ connection! D’oh! At the risk of getting on the wrong side of people, a lot of mixed messages come from IB workshops, in my experience. I guess we just have to be respectfully critical, cross-reference with ‘best practice’ research, and take some things with a grain of salt! I wholeheartedly agree with your sentiment that students, especially younger students, shouldn’t be required to memorise words and definitions before inquiries begin, absolutely not! Thanks for your reply, and keep your insightful posts coming, please! I, too, agree with many of the concepts (pun unavoidable) in your post, particularly regarding developing conceptual understanding, but I think your statements about the PYP key concepts misrepresent, and perhaps misunderstand, their intended role in the inquiry process. l am shocked by your claim that an IB workshop leader would actually suggest that students must be taught the 8 key PYP concept “words and their meanings explicitly (& in isolation)”. I am a PYP Coordinator and IB workshop leader. I have facilitated the Concept Based Learning workshop many times and can assure you that any practice involving “remembering” or “reciting” key concept words would not be condoned by the IB or anyone with a genuine understanding of concept based learning. It’s important to remember that the 8 key concept words are actually presented in conjunction with key conceptual questions. I have found from experience, that unless you focus on those questions, both in planning with teachers and inquiring with students, the words themselves can remain just words. It is the questions that give the words context and application, and as a consequence, meaning. The role of the key concepts and questions in any unit of inquiry is to provide depth and direction; without them, students and teachers may be more inclined to want to cover all aspects of a central idea, resulting in superficiality rather than deep understanding. The exploration and re-exploration of the key concepts throughout the programme of inquiry also helps students make transdisciplinary connections, as well as connections within particular subject domains. You refer a few times to “laminated” words and posters, and started your post with very emotive words describing your feelings towards them. Let me reassure you that the IB in no way prescribes any such thing, although it is important to have the PYP and and UOI elements displayed for the benefit of everyone in your learning community. There is, in fact, a phrase that has been in PYP circles for many years now, which has become a bit of a cliché, “Live it, don’t laminate it”! If you haven’t come across it yet, it might come in handy! I hope this helps you continue to clarify the role of concepts in the PYP. Thank you very much for the comment. Indeed, the message, “Live it, don’t laminate it” is so important and I certainly endorse making the PYP elements visible in learning spaces. Thank you for pointing out that the opening statements are emotive and even misleading. I apologise if I’ve misrepresented the IB. It’s true that I was disappointed with one workshop, as I heard conceptual learning being limited to recalling or defining a set of words. However, this was just one experience. I know this is not the standpoint of the IB and I’m a passionate advocate of the concept-based curriculum of the PYP. In hindsight, it was good to hear someone present an opposing opinion, in order to clarify what I really do understand about conceptual teaching & learning. I was so glad that the IB included only an excerpt of this post in their blog – not my opening ramble! Thanks for your wise comment about using the conceptual questions, as the drivers for inquiry, both for teachers and students. I agree wholeheartedly and didn’t make this clear in my post. I aimed to discuss the importance of questions; however, I did not specifically link the key concept words, with their accompanying conceptual questions – so thank you for adding this clarification. Certainly, this strengthens the explanation and I do appreciate your feedback.